If you’ve been following my blog recently, you will know that I am totally digging the idea of photoseries–you know, turning ordinary food photography into fun-derful stories. This recipe deserves its own photoseries. Let me put it this way: this is the single most-requested potluck, party, zombie-apocalypse-you-name-it-event recipe I have ever made. So will you want to print, Pin, and share this recipe on Facebook? You bet your bowling balls you will. Let’s make one thing clear. Like most addictions, this snack mix is liable to ruin your life. Willpower? Buh-bye. Your ex? Kow-towing at your doorstep. And diet what? But it’s important to get all of these minor questions out of the way first, because then we can talk about why my friends are spamming my text inbox and Facebook wall with requests for this. Damn. Crack. Nobody who has tasted it seems to know what goes into it. I have tested this recipe on 20+ unsuspecting victims wonderful friends and the very first question to leave all of their crack-coated lips never fails to be, “What the HECK did you put in this, Ala?” A brawl almost literally broke out over the remaining caramelly crumbs when I brought this to a party last weekend, which is always kind of a major ego boost. It’s a pity fights don’t break out over me like this. But I’ll let you in on the secret. SHHHH. Throw in some cereal. Whatever you have on hand works. I had those Chex Mix corn squares. Chop up some of whatever else you have on hand. Leftover Halloween candy? Great. Frozen cookie dough? No problem. Nuts? Perfecto. Actual crack? GO FOR IT. No, maybe you shouldn’t…not that you’ll need it, anyway. I went ahead and mixed in some chopped-up failed blobby cookies, then threw in cookie butter for good measure. Because I’m a sadist that way. Then throw some butter, lots of brown sugar, and corn syrup into a pot on the stovetop. Don’t be shy. Your waistline will become intimately acquainted with the mixture shortly. Let that cook up and caramelize into a crazy creamy goo. Stir in some more cookie butter if you must. Stir in some baking soda, salt, cinnamon, and vanilla extract, then spread your cereal mix on a cookie sheet and pour the whole caramel shebang over it with the blissful knowledge that about half of it will get stuck on the sides of the pot and you will have to lick it all off yourself. Feel free to do your “clean-up” while you throw the tray into the cookie tray into the oven to bake. Print this recipe! Did you enjoy this photoseries? I would love to hear your feedback and comments. For more fun-derful updates from Wallflour Girl, follow me on Pinterest and Facebook. See you on the crack–er, flip side! Line a cookie sheet with lightly-greased foil. 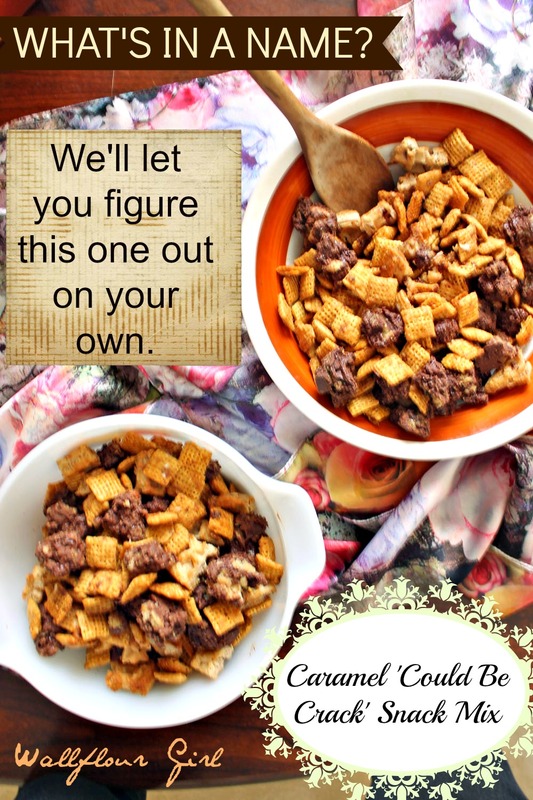 Toss together cereal and mix-ins on lined cookie sheet. Set aside. In a large pot over medium heat, heat up butter (or butter & cookie butter) until melted. Add brown sugar, corn syrup, and salt. Bring to a boil and allow to boil for 4 minutes without stirring. Your mixture should reach a deep caramel-brown color at this point. Turn off burner and remove pot from heat. Stir in baking soda, cinnamon, and vanilla. Pour caramel mixture evenly over cereal mixture, taking care to coat cereal thoroughly. Don’t be afraid to stick your spoon (or hands) in there to make sure you get every last bit crack-ified. 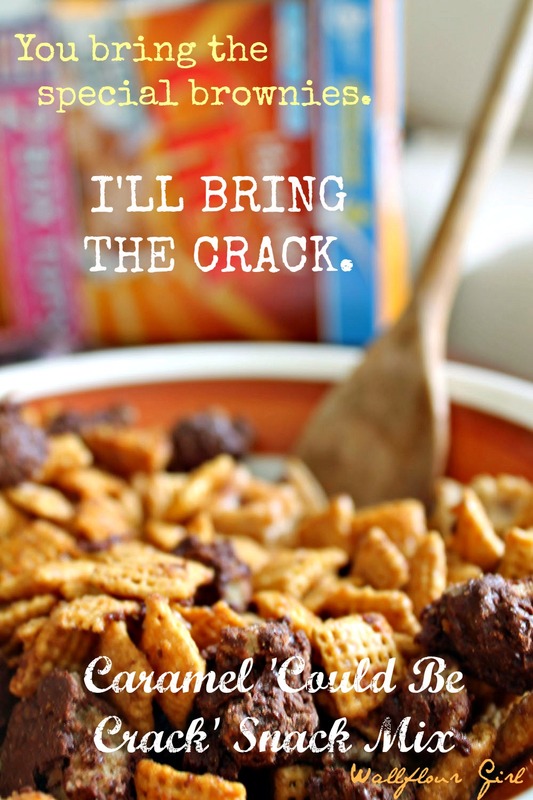 Bake in preheated oven for 60-75 minutes, stirring cereal every 15 minutes to get an even crunch. Your mix will be ready to take out from the oven when the cereal begins to feel crispy but has not completely hardened. Allow to cool completely before serving to the friends pining outside your door. Finally, a snack mix with the gumption to not even pretend to be healthy. If I’m eating a snack mix, I don’t need to pretend the pretzels, nuts, or dried apricots thrown in are somehow overpowering the peanut butter, chocolate, caramel or other sugary goodness that steals the show. ^-^ Thank you for sharing this delightfully sweet and honest recipe. 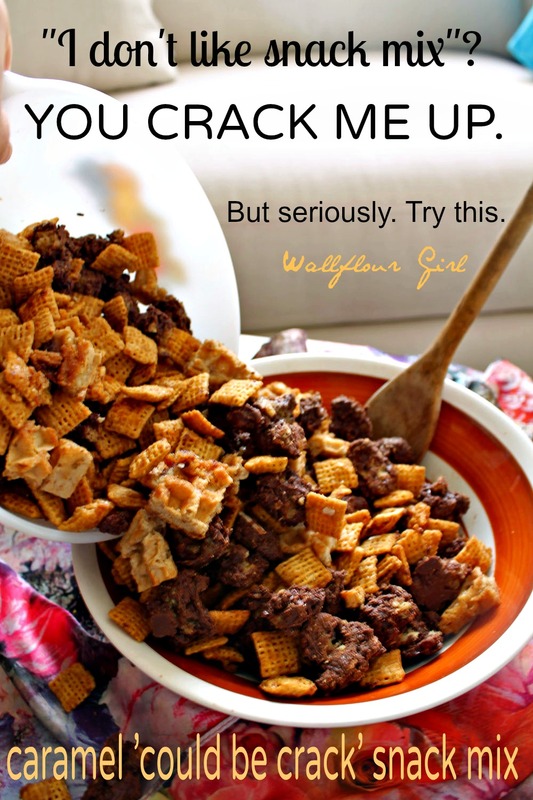 By the way, are those waffle pieces mixed in, in the “You crack me up” photo? I totally agree–my friends joke that I should make the disclaimer “I am feeding you mercilessly so that I do not eat this heart attack all by myself” whenever I bring anything particularly sugary and addictive to share. And yes, those are frozen waffles, good catch! I forgot I had added them into one of the batches, but they’re a wonderful addition. Thanks for stopping by and saying hello, Tifa! Yum! Throwing in chopped up leftover cookies is a brilliant idea! As my mom says, never waste when you can help it–thanks for stopping by! 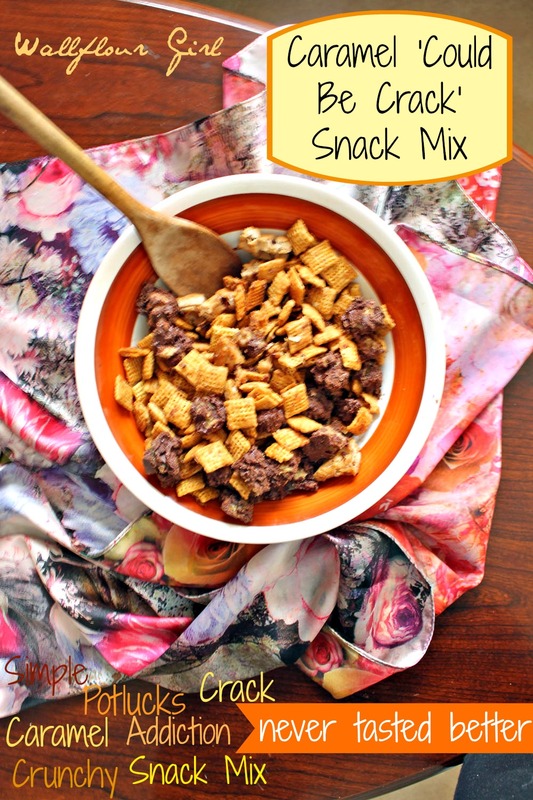 Great snack mix. Love the cookie in the mix. It’s my favorite part, too–thanks, Lail! Fun stuff! We make homemade Chex Mix all the time, but ours doesn’t get to 11 like this one does. Really fun – thanks. You guys have all sorts of fun things going on in your kitchen, I love it. Thanks, John! This looks SO good! And I have a feeling I would be eating it all, handful by handful, until it was gone embarrassingly quickly. So glad I found your blog!! OH, I know the feeling, Rachel! The guilt may or may not have prompted me to make a second batch…and then a third…Thanks for stopping by, I’m so glad to meet you and can’t wait to check yours out right now! This post was hilarious! 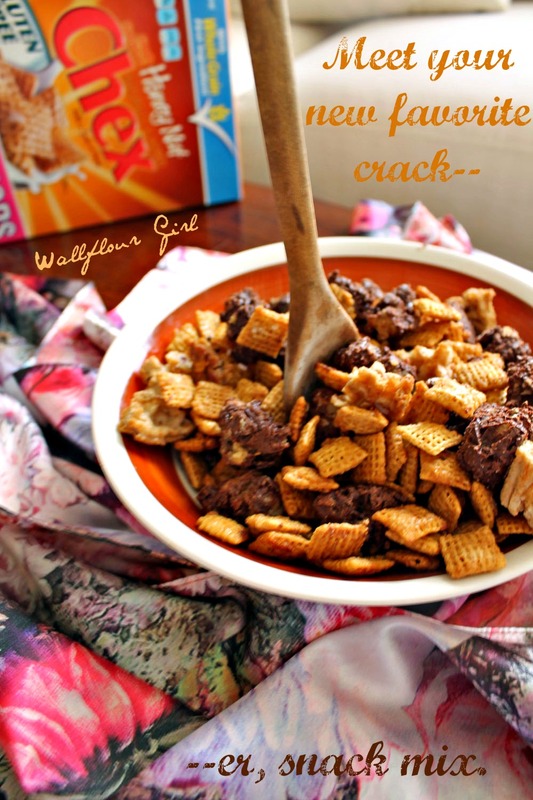 I 100% agree with caramel being crack – how addicting! Thanks so much! I love your blog site name 😉 glad you could stop by and read. Omg woman you have me really wanting to make this but I KNOW I can’t…it probably won’t even make it out of my house if you let me near something like this! 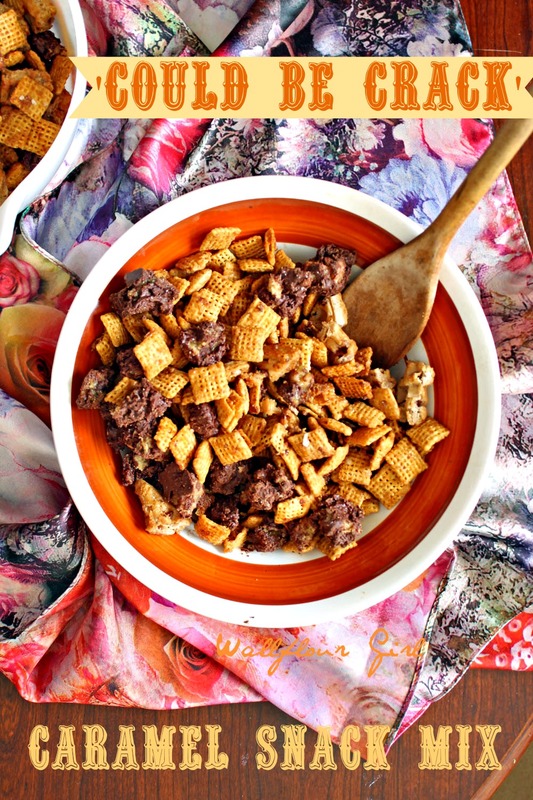 I can eat puppy chow like a champ…something this amazing would be oh so dangerous. I’m not sure what exactly you mean by photoseries (putting the words on the photos), but whatever you’re doing in this post, I LOVE IT! So colorful and fun! Thanks so much, Erika! I can tell you that this definitely did NOT make it out past my doorstep the first time…nor the second time…and I definitely second the title of puppy chow champ. I’m glad you enjoyed it and that you could stop by to read! What a fun recipe and I’m sure they are really addictive as the name suggest! hm…I’m getting curious on your special brownies too! hahaha…. Hehe, brownies may not be family-friendly, Amy 😉 but this recipe sure is. Thanks for stopping by, as always!